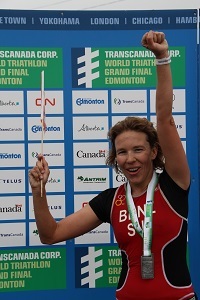 As the winner of the 2014 Edmonton Grand Final sprint distance race in the women’s 30-34 category and having just missed the podium in the standard distance, Sandrine Benz knows a thing or two about what it takes to balance a job & training. Check out her tips. How did you get involved in triathlon? I got involved in cross-country running during my foreign exchange year in the U.S. at the age of 17. After three years of running, my knees were badly hurt and forced me to stop running. After having had surgery on both of my knees, the first thing I was allowed to do was swimming. Eager to finally get back in shape, I joined a swimming club and attended their practice three times a week. Six months later, the doctor recommended that I start building up some strength in my legs by cycling. Never really having cycled before, I bought a second-hand road bike and started riding it in addition to the swim practices. At the age of 22, I was finally allowed to start running again. The immense joy of running I used to know returned quickly. Not wanting to give up on swimming and cycling any more, I decided to give it a shot in triathlon. Pretty much every day, often two sessions per day (either swim and bike or swim and run). What motivates you to race? I love the atmosphere at international races and enjoy getting to know athletes from all edges of the world. Another motivation of mine is to find out where my physical limits really are and how far I can push them further. Have you encountered any training obstacles? How have you gotten over them? What tips do you have for balancing relationships, work and training? Associate yourself with people who also do triathlon. This enables you to meet friends / take care of your relationship while training. Try to do workouts with quality instead of collecting as many training hours as possible. That’ll give you more free time besides work. In terms of work, I have made the best experience to talk to my employer about my triathlon ambitions and the possibilities of creating a suitable job setup for my needs (maybe reduce to part-time-work, fix the working hours so that you can plan trainings around them; work more in the off-season than during race season). Inside on the bike trainer: 3 hour bike ride as 1 hour long ride effort, 1 hour as 6x (5min hard, 5min easy), 1 hour as (8min hard, 2min easy). Cadence what feels natural.